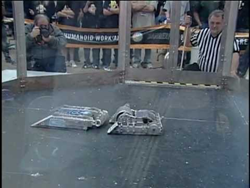 HGR Industrial Surplus will be among more than two dozen sponsors for this year’s Alliance for Working Together RoboBots competition that will see robots built by 25 Northeast Ohio high schools battle at Lakeland Community College this spring. 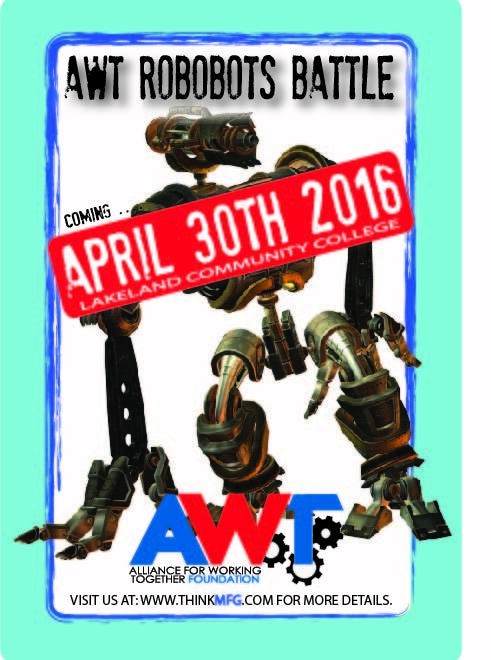 A robot built by Euclid High School students battles it out in last year's AWT RoboBots competition at Lakeland Community College. This year, the number of students interested in robotics has gone through the roof. Each team of students will design and build a battle robot, submit a portfolio and participate in a group interview before placing their robot in the battle cage on April 30, the day of the local competition. The robots will then battle it out, weapon-to-weapon, to see whose robot is the last one rolling. HGR and SC Industries are co-sponsoring the Euclid High School team, which tied for ninth place in a field of 35 competitors last year. The team and its success sparked increased student interest in robotics that resulted in the school establishing a Robotics Club that meets weekly and plans to add a robotics course to its STEM curriculum next year. Last year’s team had 10 honors physics students as members. This year, the number of students interested in robotics has gone through the roof, according to Bob Torrelli, physics teacher and department chair who heads the effort. He said he has 50 students participating in the group, which meets after school and on weekends. To include everyone, Torrelli has 40 of the students working on four Lego robotics kit valued at several thousand dollars each that were donated by HGR. Meanwhile the 10 team members, including five who are returning from last year’s group, work on the competition battle robot. When choosing team members, Torrelli considered attendance, how well students work with others and how well they follow instructions, along with their design and programming skills. Team members are on track with the design, manufacturer and assembly process, according to Torrelli. They have put the design into CAD and have had the rails manufactured by Fredon Corp. of Mentor. Assembly of the robot, which must weigh less than three pounds and be constructed from a kit, is underway. Some design changes to last year’s battle bot were considered, including moving the wheels inside the body to protect them, modifying the weapons and using a stronger metal housing, Torrelli said. The team will be able to see how their RoboBot performs during open cage time scheduled Jan. 2 through April 25. The Euclid team has already experienced success. Some of its members attended the Nov. 7 Young Astronaut Day at NASA’s Glenn Research Center and placed in the top three in two competitions. The AWT RoboBots competition is designed to teach students about STEM careers and help develop the next generation of our skilled workforce and includes events designed to help stimulate an interest in aeronautics, space science and engineering. Any participating team can go on to the National Robotics League contest scheduled for May 20-21. Andrews Osborne Academy, A-Tech, Auburn Career Center, Beaumont High School, Cleveland Heights High School, Cornerstone Christian Academy, East Community Learning Center of Akron Public Schools, Euclid High School, Four Cities Educational Compact, Harvey High School, iSTEM ECHS, Kirtland High School, Lake Catholic Lake Shore Compact, Madison High School, Maplewood Career Center, Max Hayes, Mentor High School, North High School, Perry High School, Polaris Career Center, Rittman High School, Riverside High School, VASJ High School, West Geauga High School and Wickliffe High School. Short Run Machine Products, Fargo Machine, USM Precision Products, Christopher Tool, Nottingham Spirk, Talan Products, Ohio Ordnance Works, HGR Industrial Surplus, SC Industries, Sattler Company, Flohr Machine Co., Avery Dennison, U.S. Endoscopy, Heisler Tool/Precision Machining Institute, Suburban Manufacturing, Torque Transmission, South Shore Controls, Allen Aircraft, Libra Industries, Spence Technologies, Jergens Inc., Criterion Tool & Die, Fredon Corp., Heisler Tool, Precision Machining Institute, Burton Industries and Universal Metal Products.